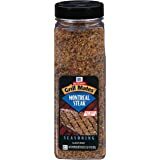 So, we have been using Montreal Steak Seasoning for YEARS. My wife got me using this for almost everything. When I say everything, I mean almost everything. Eggs? Check. Hamburger? Sure. Chicken? Why not. Hot dogs? Go crazy. This is something almost everyone should have in their cupboard. The only knock is the sodium content. BUT, you should always taste test and know when to season sparingly. 5.0 颗星，最多 5 颗星The best! This stuff is fantastic on not just steak, but also pork and other meats. 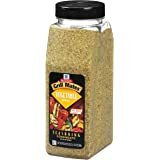 It's a great way to add flavor and an extra kick to just about anything. Keep in mind it's very high in salt, so don't go overboard with it. Amazon's price is fantastic, and the large bottle is significantly cheaper than the small ones. 4.0 颗星，最多 5 颗星Still a good buy for a versatile mix! 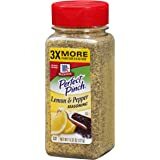 I bought this seasoning frequently when it was first on market, coupons were plentiful, and sales were frequent. Then....the prices went up, coupons decreased, and I stopped buying it very often, but missed it in the kitchen. It's a handy blend which I haven't replicated in homemade form yet. 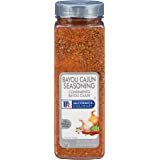 I use it on beef, chicken, and some pork, and even a dash or two in stir fry vegetables as well. This is a better buy than the small jars at the store. UPDATE - 4/2016 - This blend continues to be a staple in our kitchen. It's regular go-to for stir frying veggies; putting into the crockpot's water when cooking chicken for salad; or roasting green beans. 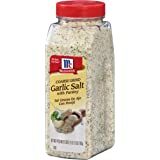 I will note that make sure you don't add salt in addition to this blend and taste as you go so whatever you're cooking doesn't get too salty. 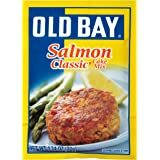 At times, I stop adding this mix and add individual seasonings IF it needs something else. I love this stuff. 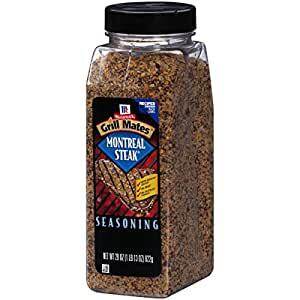 Favorite steak seasoning since forever. After tasting it, I've had many other's agree and start stocking this stuff themselves. I tend to buy fairly thick steaks, so liberally apply this to the surface and edges. On thin steaks, you'll want to go easy because it is pretty salty. 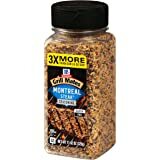 I got a jar this size at costco one time, but now they only stock the Chicago Steak Seasoning, which I like much less. Since I go through pretty ridiculous quantities of this I'm glad to have found the large container here on Amazon. 5.0 颗星，最多 5 颗星I put this stuff on everything. Seriously, I put this in almost every dinner I cook. Burgers, pork roast, drumsticks. I even shake some in to the ground meat when browning for spaghetti sauce. 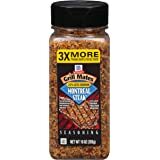 It just makes meat taste meatier and possibly more expensive, but without a strong identifying flavor like garlic or cumin or chipotle would (not that you should add cumin or chipotle to spaghetti sauce - so much yuck going on there). It even helps bring along mushrooms, eggplant, zucchini and the like, making them taste way less vegan.